The ignition system to top all ignition systems! Completely redesigned and backed by an industry leading warranty, these igniters are built to last. We increased the warranty from 2 to 10 years! No that’s not a typo, these igniters are guaranteed for a decade! Our electronic ignition is ensured to ignite every time so you can be confident knowing it will light the first time, every time. “Infinity” isn’t just a clever name, it’s what we expect from our igniters. From the first light out of the box to the 1000th, the igniter won’t let you down! We placed the module away from the heat and protected it from the elements. It has been redesigned for even more consistency. The battery compartment has also been relocated for easier access and the battery is a standard AA size so you won’t be searching for one of those dreaded disc batteries! With the wires being so close to the heat we beefed them up by giving them a heavy duty coating to improve their heat resistance. Each burner has its own individual electrode. The electrodes snap into place on the burners with set tabs for perfect placement which helps to ensure a consistent spark. To help with ignition, there is a ceramic hood on the front of the electrode that captures the correct amount of gas. The entire electrode is also weather and heat resistant. No more raining on your igniter’s parade! Genesis II – Genesis II offers independent ignition. You turn the control knob to the start/high position and press the igniter button to ignite each burner. 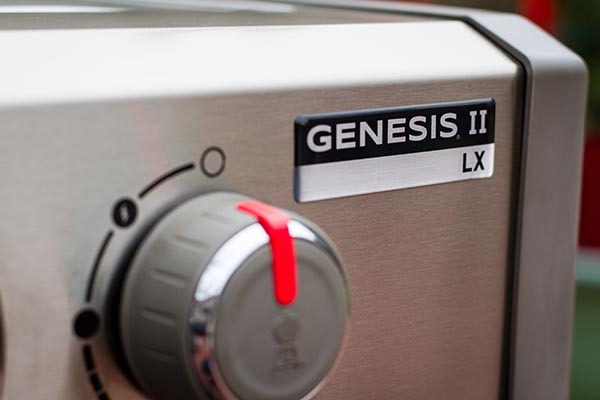 Genesis II LX – Genesis II LX offers a stove like operation. You turn the control knob to the start/high position and it will automatically ignite the burner. With a worry-free ignition system you can focus on crafting your grilling skills by trying one of our many awesome recipes!